If you ever needed more evidence of how China is becoming an increasingly connected country, aided not least by the growth of mobile Internet access, you just got it. China ended last year with 618 million Internet users and 500 million mobile Internet users, according to a report published by state-affiliated research organization China Internet Network Information Center (CNNIC), spotted first by Tech in Asia. This means the country tacked on 54 million new Internet users from 2012, while mobile Internet users increased year-on-year by 80 million people. 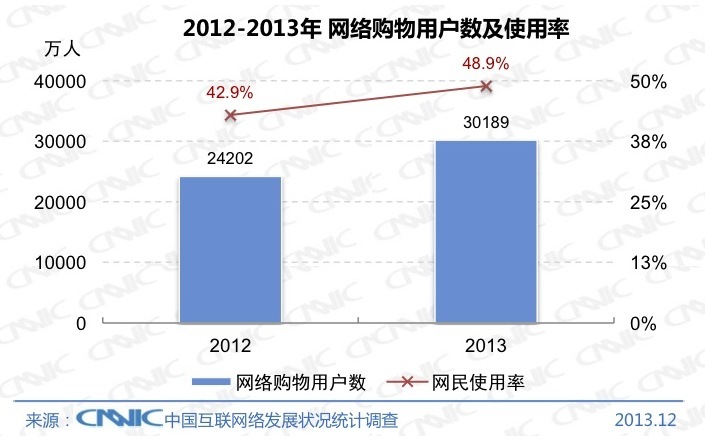 The Internet penetration rate in China also climbed to 45.8 percent at the end of last year from 42.1 percent in 2012. 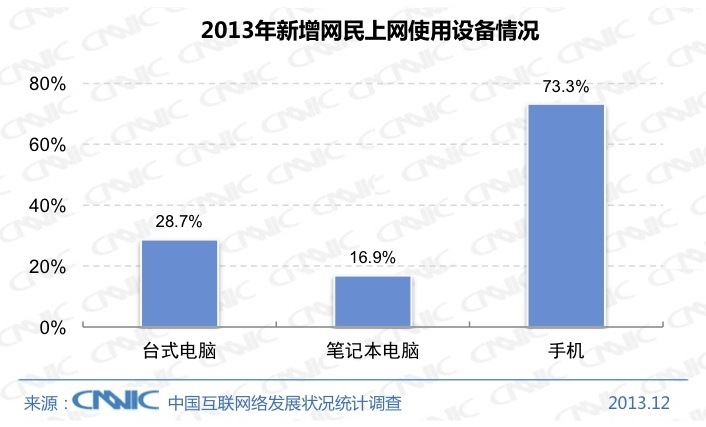 The percentage of Chinese users accessing the Internet via mobile grew to 81 percent in 2013 from 74.5 percent in 2012. In the meantime though, there was bad news for desktop computer and laptop usage. Both fell in 2013 — the former by 0.8 of a percentage point to 69.7 percent, and the latter by 1.8 percentage points to 44.1 percent. 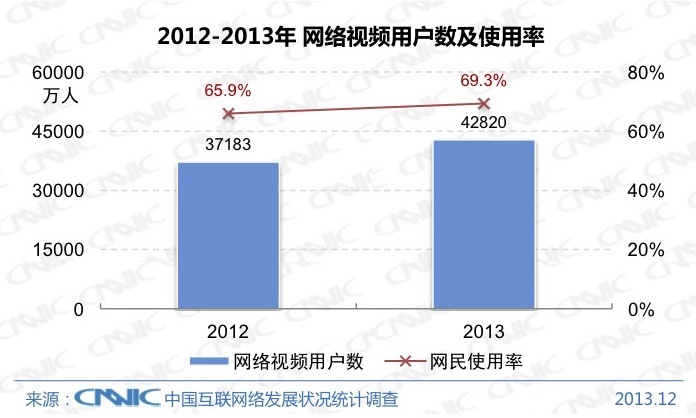 The CNNIC report noted that the continued growth of smartphone users has prompted more development in mobile. A particularly interesting statistic is that as of end-2013, the number of microblogging users actually fell by 27.8 million users, while usage declined by 9.2 percentage points. 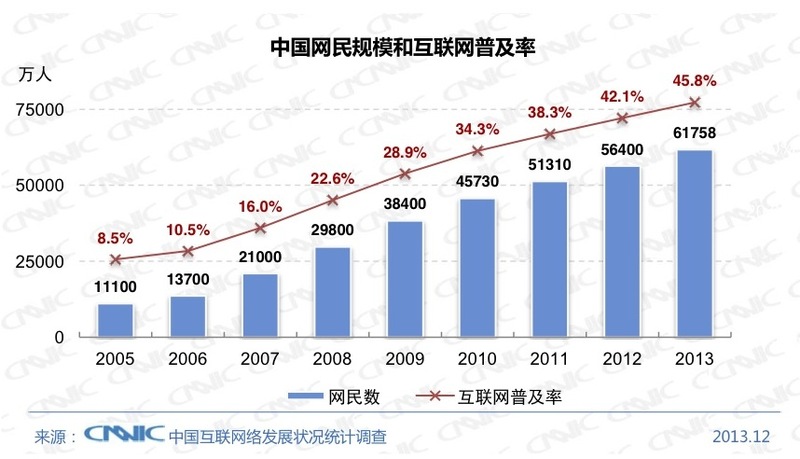 Comparatively, microblogging users had jumped in 2012 to reach 309 million at the end of the year, up 58.73 million from 2011. Meanwhile, the number of instant messaging users rose to 532 million by the end of 2013, marking a year-on-year increase of 64.4 million users, while the usage rate hit a high of 86.2 percent. Basically, these figures bode well for messaging services such as Tencent-owned WeChat (users in China get a version known as Weixin), but represent bad news for Twitter-like microblogging platform Sina Weibo. Meanwhile, more people are watching online videos on their mobile devices — 247 million people did so in 2013, an increase of 83.8 percent from the 112 million people in 2012, while the usage rate increased to 69.3 percent from 65.9 percent. 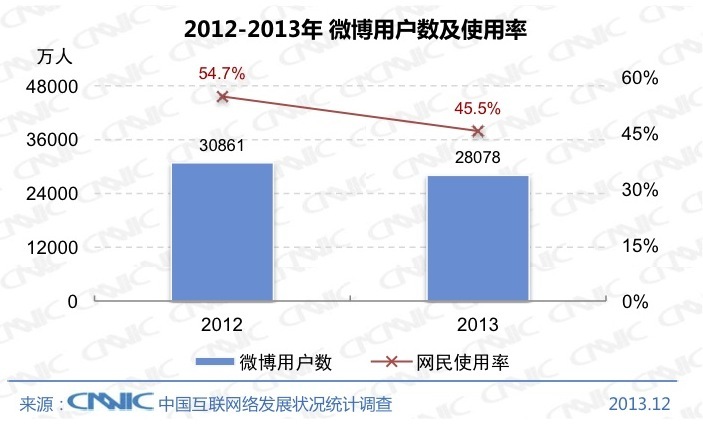 As for games, the trend of Chinese users moving to mobile away from PC was also clearly seen in 2013. There was an overall slowdown in the growth of online game subscribers, with the country’s Internet gaming population only adding on 2.34 million people. However, on the contrary, there was a 54.5 percent growth in the number of users playing mobile games, up 75.9 million from the end of 2012 to reach 215 million. 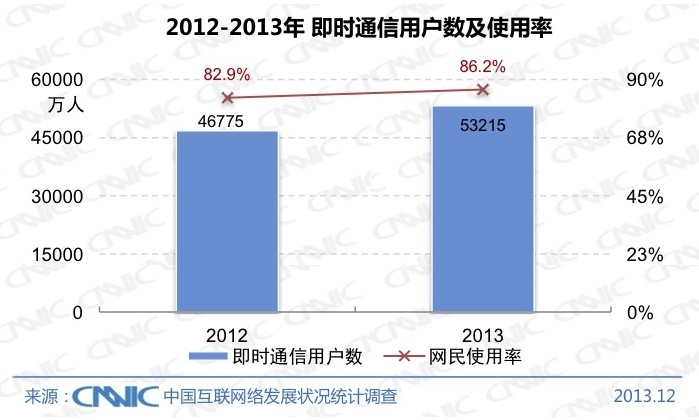 The appetite for shopping continued posting strong growth in 2013 though. China’s online shopping population grew to 302 million, up 24.7 percent or 59.9 million from last year, while the usage rate rose to 48.9 percent from 42.1 percent. As for payments, the number of users transacting over the Internet grew to 260 million in 2013, up by 39.5 million — while the usage rate displayed whopping growth, rising to 42.1 percent from 17.9 percent. 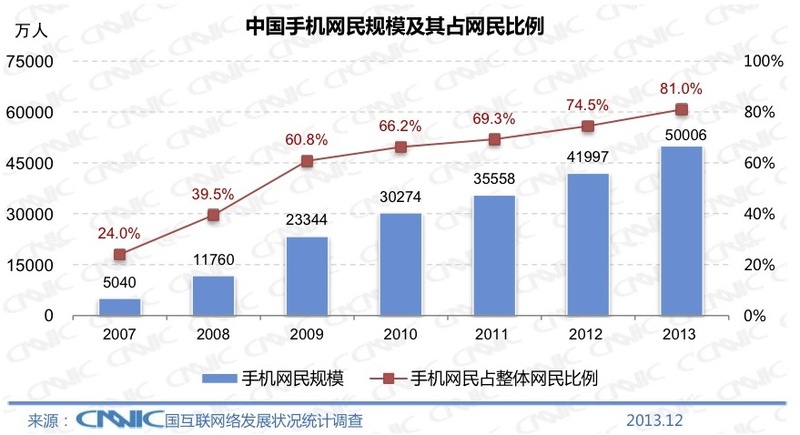 This comes as more mobile platforms are adding payment services, while offline merchants are starting to integrate deeper with online payment options, CNNIC explains. In 2013, Chinese mobile Internet users actually made changes to their behavior, as in the trends noted so far — and this will probably ignite a race between China’s tech giants, which have to work at tailoring their products accordingly this year.